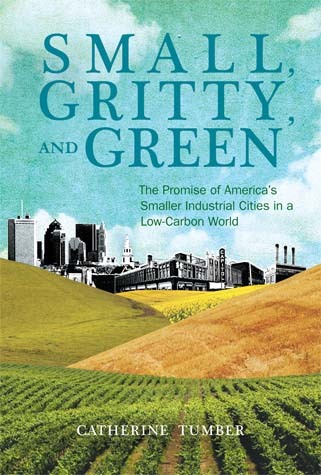 SMALL, GRITTY, AND GREEN: The Promise of America’s Smaller Industrial Cities in a Low-Carbon World. By Catherine Tumber. Cambridge, MA: MIT Press. 2012. Cities like Peoria, Syracuse, and Flint rarely enter conversations about places that hold considerable promise as sustainability exemplars. Catherine Tumber seeks to change this situation, however, by arguing cities such as these can and should emerge as models of urban resilience in coming years. It is precisely those qualities that have rendered them unnoticed—their small to middling sizes, their diminished industrial cores, and their dense but decaying built environments—that provide these cities with the basis for a greener, more sustainable future. Tumber is no idealist. She recognizes the challenges these cities face in becoming sustainable, and describes how they have been “battered, disproportionately fractured by urban highway development and the flight of retail to the suburbs; (and) eviscerated by deindustrialization and the global economy…” (xxxii). Ultimately, she seeks to identify and explain a variety of opportunities for them to emerge stronger, greener, and responsive to the needs of a low-carbon future. The idea strands Tumber weaves together are as diverse as the cities she describes, and not always entirely cohesive. The book is part historical and part case study analysis. Through her travels to 25 cities in Illinois, Indiana, Michigan, Ohio and Wisconsin, she interviewed numerous local officials and citizens about the current status of their communities and efforts they are making to recover from decades of decline. To this anecdotal information, she mixes in additional ideas from authors and other experts on urban issues, and blends in further historical perspectives, such as the work of Jane Jacobs. The result is quite interesting, but also somewhat idiosyncratic, as Tumber herself observes in the book’s introduction. Each chapter explores a different realm of potential for these cities, with the main areas of promise Tumber investigates tied to agricultural and renewable energy production. Small to midsize cities, for example, have proximity to productive agricultural lands and, in some cases, vacant city properties where market gardening is possible. Growing interest in sustainable, locally sourced foods, Tumber says, renders these cities key contributors to a future of more urban agriculture and its lower energy inputs. Perhaps more encouraging from an economic development perspective are the possibilities she envisions for renewable energy. Here she goes so far as to argue that “smaller industrial cities can make distinct contributions to—and derive distinct benefits from—a clean energy economy in ways that large cities and small towns cannot” (90). Wind, solar, and bioenergy all have a place in Tumber’s vision of the future, with the strong manufacturing histories of these cities position them well to produce the technical components of these energy sources. Muncie, Indiana, for instance, has attracted new jobs related to wind energy in part thanks to its long history of manufacturing automotive gears and transmissions. Workers skilled in these areas are now producing wind turbine gearboxes. Other Rust Belt cities have similar potential for green technology initiatives, argues Tumber. Readers who seek inspiration for understanding how smaller, industrial cities can contribute to and bring about a more sustainable future are sure to find many ideas in this book. While these ideas come fast and furious, and are more intriguing than they are academically rigorous, Catherine Tumber has set the stage for what may well be a new realm of conversation about urban sustainability. I’d really like to be a part of online community where I can get advice from other knowledgeable people that share the same interest. If you have any suggestions, please let me know. Bless you!